This year, Beverley Forrester was invited to show her latest collection, 'Hurunui' as part of the BMW New Generation Show at NZ Fashion Week in Auckland. New Zealand Fashion Week is without a doubt the most important week for the local fashion industry, not only for the established designers, but for those designers who are just starting out. Making a name for yourself in a cut-throat industry isn't easy and especially in the small New Zealand market. NZFW has always supported the new and emerging talent by offering various accessible and affordable platforms in the form of the BMW New Generation show and the Contemporary Salon group shows. As well as these, emerging designers can enter the Miromoda Fashion Design Awards or the Westpca Young Fashion Designer Competition, the winners of which are also showcased at the event to large audiences. Supporting 2013's New Generation designers, Crooked Seven, Nara Paz and Beverley Riverina, together NZFW and BMW provided not only a platform for them to show their collections but also a 'boot camp' where the designers received mentoring from some of the biggest names in the business. This collaboration not only ensured their designs were seen on the catwalk, but also on the streets of Aucklnad as each designer was given the opportunity to transform an Ultimate Driving Machine into a unique illustration of their collection. During the bootcamp, the designers heard from Managing Director of BMW New Zealand, Nina Englert, who offered the designers some insight into one of the world's most reputable brands, and shared the success story behind the Ultimate Driving Machine. Renowned Chef and BMW Brand Ambassador Josh Emmett joined Dan Gosling, owner of Black Box Boutique and co-owner of Stolen Girlfriend's Club, to provide some sound business and branding advice. Following boot camp the designers revealed their personal design work, wrapped around either an all-new BMW 3 Series Touring or X1. These three vehicles were part of the official NZFW fleet, which could be seen around Auckland in the build up to and during this year's event, transporting VIP's between shows. This year BMW also added a new and exciting element to the programme, offering one of the 2013 New Generation Designers a much-needed financial boost, with the BMW People's Choice Award. 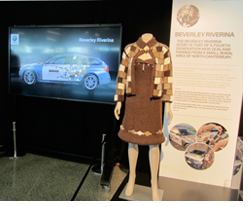 A piece from each designer's collection and their vehicle wrap design was on display inside the Viaduct Events Centre throughout NZFW. Voting for this award ran throughout the event and everyone attending had the chance to vote for their favourite New Generation Designer. The winner was announced at the conclusion of the New Generation Show on 5th September, and Crooked Seven was presented with $5,000 from BMW to go towards further developing their business career.